The issue of ancient writing on metal plates is a key topic for Book of Mormon students. It's a topic I address on my LDS FAQ page on metals in The Book of Mormon. Since the day of Joseph Smith, there has been abundant evidence of ancient writing on metal plates, but this evidence has essentially all come from the Old World. Critics still contend that there is no evidence for such a thing in the New World, where The Book of Mormon primarily took place. So is there any evidence for writing on metal in the ancient Americas? First note that The Book of Mormon does not indicate that writing on metal was a widespread, traditional activity of peoples in the Americas, but was a practice brought from the Old World and maintained by a few prophets and leaders seeking to preserve rare and precious records. The Book of Mormon text and the history of its many witnesses is evidence for the reality of writing on metal in the Americas. But there may be other examples of writing on metal in the New World that will yet be discovered, as our knowledge of the ancient Americans and state of archaeological exploration there is still in its infancy compared to the Bible lands. However, there may be some further hints about ancient writing on metal plates to consider. One example, called to my attention in an excellent and previously unpublished essay by Mark Treter, a sharp Latter-day Saint in Wisconsin, is a sacred copper relic that was observed in 1842 by William W. Warren. Mark's essay is posted below, with his kind permission. The writings of William Warren are found in his History of the Ojibways, Based upon Traditions and Oral Statements (St. Paul : Minnesota Historical Society, 1885, available online at http://imp.lss.wisc.edu, a PDF file with more than 300 pages). Warren's book provides an interesting section that Mark discusses (this begins at page 63 of the PDF file, which is apparently page 89 of the original book). William Warren's eyewitness account is the only evidence I know of for the metal record kept by some of the Ojibwe (also spelled Ojibway) people that Mark Treter discusses. So is Warren's account plausible and reliable? After a little searching, I found possible corroborating evidence in the book Native American Mathematics by Michael P. Closs (Austin, Texas: University of Texas Press, 1986). Beginning on page 181 is a relevant chapter entitled "Tallies and the Ritual Use of Number in Ojibway Pictography." The documented use of tally marks and pictographs to convey information about family lines (especially see p. 183) is consistent with the report of Warren, and adds to the plausibility of his report, in my opinion. Here is the essay from Brother Treter. Thanks, Mark, for your contribution! For students of The Book of Mormon, an interesting event is referenced in the pages of History of the Ojibway People, by William W. Warren.1 The event is also of interest to Wisconsin archeologists because of its reference to metal objects fashioned by Native Americans in Wisconsin. 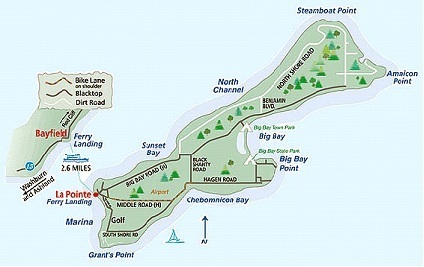 According to Warren, as a teenager in 1842, he was in the company of his father and mother visiting the Ojibway town that had been a capital or principal gathering place, founded at the mouth of Chequameogon Bay on what is now called Madeline Island in Lake Superior, one of the Apostle Islands. In 1693, French explorers had established a fort and trading post near there which they called La Pointe. The Ojibway town and the trading post are located at the southern end of the island, approximately 2.6 miles across the water from the Wisconsin shoreline along Lake Superior. This location was one of the first outposts for the Ojibway migrating westward under pressure from other tribes, and was selected by the Ojibway for their first settlement in that area of Wisconsin because of the additional security provided by being on an island. Warren's family was visiting his mother's uncle, who was a chief of the Crane clan. It should be noted that there were smaller Ojibway towns established all along the shore of Lake Superior from Fond du Lac, Minnesota (on the Wisconsin-Minnesota border at the extreme western end of Lake Superior's waterways) to Keweenaw Bay on the east. Warren reports that the Ojibway found a successful life in these lands. Fur was plentiful, fishing was good among the nearby islands, large fields of corn and squash were cultivated, and wild rice was harvested in the lakes and streams. Also, after the French abandoned the trading post at La Pointe in 1698, the other tribes of the area, such as the Fox and Lakota (or Dakota), had no choice but to obtain European goods through their neighbors the Ojibway. In the winter months, hunting bands traveled deep into Wisconsin woods to the south. But in the summer, Ojibway people from the whole area, as well as from the north shore of Lake Superior, came to Chequamegon on the island for the Medewiwin (or "Grand Medicine") ceremonies. These religious gatherings of the Ojibway nation were held in a great lodge which stood in the principal village on Madeline Island. For students of The Book of Mormon, it is of interest that this sacred relic was kept hidden in an underground location. Warren reports, "[T]he old chief kept it carefully buried in the ground ..." Warren reports that the chief "was about sixty years of age at the time he showed this plate of copper, which he said had descended to him direct through a long line of ancestors." Other sacred records are maintained by those initiated into the central religious rites, which ceremony and teachings Warren calls "the grand rite of the Me-da-we-win"8. The teachings of this rite are kept sacred, and even Warren admits that, despite his intimacy with these matters, he yet stands only "at the threshold" of the Me-da-we lodge. The teachings include the creation of the earth, man's true relationship to God, the global flood or deluge caused by man's wickedness. 10. Preparing a place to hide the record buried in the ground. 1 "Warren's skill and W. Roger Buffalohead's able introduction call us to read, or to reread, this classic history." -- Minnesota History. William W. Warren's History of the Ojibway People has long been recognized as a classic source on Ojibwe History and culture. Warren, the son of an Ojibwe woman, wrote his history in the hope of saving traditional stories for posterity even as he presented to the American public a sympathetic view of a people he believed were fast disappearing under the onslaught of a corrupt frontier population. He collected firsthand descriptions and stories from relatives, tribal leaders, and acquaintances and transcribed this oral history in terms that nineteenth-century whites could understand, focusing on warfare, tribal organizations, and political leaders. First published in 1885, by the Minnesota Historical Society. Current edition includes annotations researched and written by Professor Theresa Schenck. A new introduction by Schenck also gives a clear and concise history of the text and of the author, firmly establishing a place for William Warren in the tradition of American Indian intellectual thought. "The Cranes claim the honor of first having pitched their wigwams, and lighted the fire of the Ojibways at Shaug-ah-waum-ik-ong, a sand point or peninsula lying two miles immediately opposite the Island of La Pointe. "To support their pretensions, this family (of the Crane) held in their possession a circular plate of virgin copper, on which is rudely marked indentations and hieroglyphics denoting the number of generations of the family who have passed away since they first pitched their lodges at Shaug-ah-waum-ik-ong and took possession of the adjacent country, including the Island of La Pointe or Mo-ning-wun-a-kaun-ing. "When I witnessed this curious family register in 1842, it was exhibited by Tug-waug-aun-ay to my father. The old chief kept it carefully buried in the ground, and seldom displayed it. On this occasion he only brought it to view at the entreaty of my mother, whose maternal uncle he was. Father, mother, and the old chief, have all since gone to the land of spirits, and I am the only one still living who witnessed, on that occasion, this sacred relic of former days. 4 The abundance of copper in the lands of the Ojibway clans is well known, although the preparation of a copper plate for the purpose of maintaining a family or clan record or register does not appear to be elsewhere reported. Responses from tribal members to the dissemination of information about this "sacred relic" appears to be to express regret that sacred knowledge of the tribe is being divulged to those who cannot be expected to give due honor or reverence. This may account for why the existence of such items is not more generally published.